born in 1963 Novi Sad, Vojvodina, ex-Yugoslavia as a member of a Hungarian national minority. Since the outburst of the civil war in his native country (1991) he lives and works in France. “A third figure of folk-based jazz piano is ISTVÁN KOVÁCS TICKMAYER. He graduated from the Academy of Újvidék (Novi Sad) in Voivodina and has also doubled as a composer and upright bass player. His strong ties to the philosophical and musical school of György Szabados are well known. 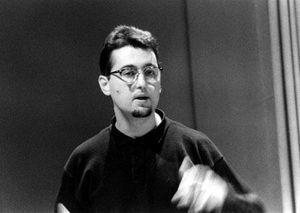 He formed his first ensemble, Formatio, with Mihály Dresch and István Grencsó in 1986. He performed several piano duos with György Szabados in 1989. Since 1991 he has lived in Paris where he has composed music and performed for József Nagy’s Theatre JEL. His music has traces of Bartók’s piano music, Szabados’s improvisation techniques, as well as speculative and far-off wanderings from the departure point. If we were to compare his music and playing to that of Szabados, the most notable difference would be this speculative and restrained, less emotional quality. Perhaps the most intriguing moments of his performance are those when he conjures up the world of ancient, percussion-based tribal music with an archaic Hungarian folk base with the help of a prepared piano. In such pieces, the piano functions primarily as an archaic percussion instrument.